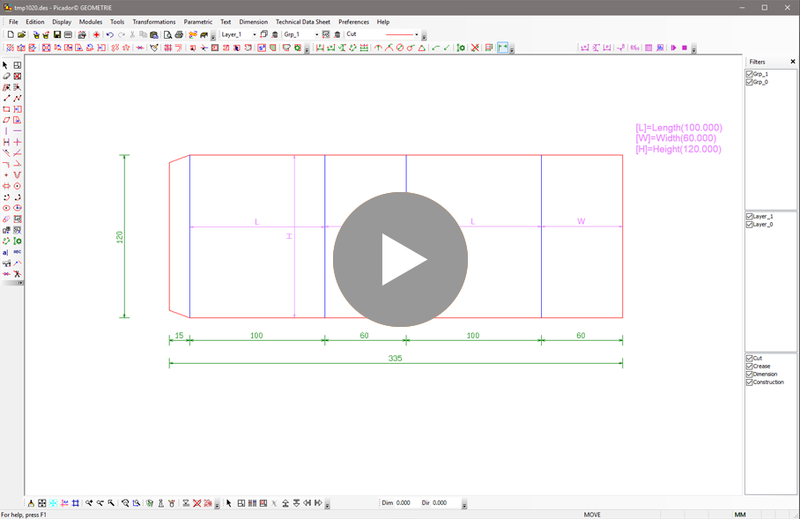 To create parametric design, it’s happen in Picador 2D, on any model you have access to the parametric tool bar. Those tools allow you to add purple dimensions on your drawing and define each dimension as a parameter (basically on or two letters). Those parameter will be editable in PackLib and allows to change the defined dimensions. 2- Parametric dimensions are applied the same as classic dimensions: 2 parallel lines, 2 points Verticals, 2 points Horizontals, Arcs. But insted of showing the dimension value, it is asking for a parameter name. For exemple, if the dimensions you are discribing is the length of the box use the letter L, W for the width, H for the height, F1, F2, F3 for the flaps, GF for the glue flap, and so on. After discribing some parametric dimensions, use the Edit parameter function to discribe the parameters and add it in the document. clic on generate to get a visual of the new parametric model, and the interface. Play with the parameter to check if every thing is working properly. Then clic on validate to export the component as .dll file.This .dll file will be automaticaly save in C:\Picador\Plugins, and could be imported in Packlib to use it as a new standards model.